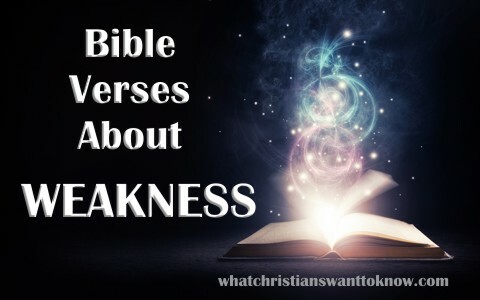 Here are 8 important Bible verses about weakness with commentary to follow. Paul prayed three times to have his “thorn in the flesh” removed, whatever it was. Since Paul was not a complainer, it must have been a very painful thorn. The thorn could represent the fall of man in the Garden when thorns first appeared on the earth. It could have been the Jews who hounded him everywhere he went. It could have been cataracts and having very poor eyesight. We just don’t know for certain what his thorn in the flesh was but that’s where God gets the glory; God’s “power is made perfect in weakness” and not in human strength. Paul can even boast in his weakness so that the power of Christ will rest on him. God’s grace was sufficient for Paul so apparently weakness is a good thing in God’s eyes because He gets the glory in what we do as it is “Not by might, nor by power, but by my Spirit, says the LORD of hosts” (Zech 4:6). Part of God’s judgment came upon Israel because they were neglecting the weakest in society like the widows, the orphans, and the strangers (or aliens). They knew better because there were written laws and codes that were to provide for these people’s needs but they ignored them. Every third year, the nation was supposed to pay a third tithe that went to support the widows and orphans and other disenfranchised people. When they started to neglect that law, the most vulnerable segment of society was hurt. That’s the time when God started withdrawing His blessings. God does just the opposite of what they were doing; He rescues the weak; He helps the needy; He delivers them from the wicked. They would have never needed rescuing from the wicked unless there were wicked rulers to be rescued from. Israel had a rich history of neglecting their widows and orphans and the Old Testament shows that they even took advantage of the weak and needy. Paul was not content just because he put his mind to it even though he knew that “godliness with contentment is great gain” (1 Tim 6:6). Paul never wrote “of being in need, for I have learned in whatever situation I am to be content” (Phil 4:11) so Paul is saying that he had to learn how to be content and having to learn something implies that they didn’t know it before. No one learns something they already know. Paul had to learn his contentment and he learned that it didn’t depend on circumstances but upon God’s promises and Paul figured, “a little with the fear of the LORD than great treasure and trouble with it” (Prov 15:16). Paul was content with weakness, writing “if we have food and clothing, we will be content with these” (1 Tim 6:8). I love Paul’s humility in this verse. Paul was arguably the greatest Apostle yet when he encountered those who were weak, poor, widows, and yes, weak in the faith, he became weak, and not lording it over them because of who he was. He condescended to anyone’s level so that he “might win the weak.” You know Paul…consumed with evangelism! He became “all things to all people” for the express purpose of saving some. Love it! We were weak to be sure. We had the incurably, fatal condition of sin. Only the blood of the Lamb of God could save us. So at the time we were so weak, Christ died for us. The timing was all God’s and it was the right time for us because we were so weakened by sin that we couldn’t save ourselves. Paul told the Colossians “And you, who were dead in your trespasses and the uncircumcision of your flesh, God made alive together with him, having forgiven us all our trespasses” (Col 2:13). I would say dead is pretty weak, wouldn’t you? Thankfully, Jesus died for the ungodly and did so at just the right time. God was rebuking the shepherds or religious leaders of Israel because they had weakened the nation by not doing what is in the law. Even worse, now they ignored the weak, left the sick to die, let the injured suffer, the straying sheep wander off with no protection, and apparently, they couldn’t care less about the lost among them. God tells Isaiah to “Strengthen the weak hands, and make firm the feeble knees” but these false shepherds abused them, ruling them by force and treating them harshly. Mankind seems to prey on the weak but God seeks out the weak, strengthens their resolve, helps the sick, binds the brokenhearted, leaves the 99 to find the one that’s lost, and this Great Shepherd leads His sheep; He never drives them. This command was written to the church at Thessalonica but it is no less written to us too. Paul said “we urge you brothers” so he means the church, and he tells them to “encourage the fainthearted” and “help the weak” but in all of that, “be patient with them all.” It’s not helpful to help the weak and not be patient with them. That’s not the Spirit-led Christian’s way. These verses about weakness make me think about my own. Maybe it’s good to express our weaknesses to one another and remind ourselves that God’s power is more easily displayed through our weaknesses. There is something we can do. We can help the weak, the widows, and the orphans, but even in that, it must be with patience and never forget we depend on God because we’re weak too. Think about that; the weak helping the weak and God receiving the glory. I love it! God works through humble vessels but resists the proud (James 4:6), so if you’re weak, God’s more likely to work through you, so take heart. God loves to glorify Himself in working through our weaknesses. This is a very important topic. I’m surprised there were no comments. He condescended to anyone’s level so that he “might win the weak.” You know Paul…consumed with evangelism! Where such information? Previous post: How Does The Bible Define Perseverance? Next post: Why Did God Keep Moses From Seeing The Promised Land?